To demonstrate that a body submerged in water loses weight equal to the volume of water it displaces. Consists of two brass pieces of equal volume. 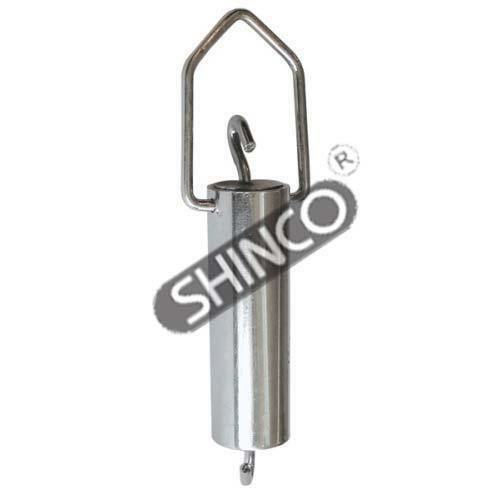 A solid cylinder 60mm long with a suspension hook at one end and a close fitting hollow bucket with a suspension loop at one end and a hook (handle) at the other end. Overall extended length is about 160mm. Since our inception in the year 1984, Sadana Brothers is an ISO 9001:2000 certified organization engaged in manufacturing, supplying, exporting & wholesaling an array of Electricity and Magnetic Instruments, Science Instruments and Biology Instrument. Under this range, we offer quality-approved Electrophoresis Power Supply, Tripod Magnifier Stool Type Table Top, Microscope Slides With Depression, Hand Microtome Simple, Scalpel Blades and Student Microscope, Junior. Apart from this, we also offer Copper Wire, Pvc Insulated, Magnet Steel Horseshow, Electrostatic Kit, Rheostat Resistor,Hoffman Electrolysis Apparatus and several more. All our products are widely applicable in medical colleges and research institutes. We provide complete consultancy regarding the designing of our products to suit every budget of our patrons. Our firm is supported with a highly qualified youth, who are constantly manufacturing unique products in order to suit the various requirements of today's advanced customer. The quality control policy of the national as well as international standards makes us stand far ahead of our competitors. Owing to strict control on the quality of products and delivery schedules, our hardworking team of professionals ensure to provide complete customer satisfaction.